Orzorga's Kitchen is a settlement found north of Orsinium. 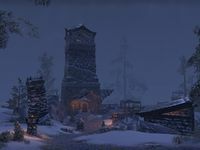 Many merchants can be found here, as well as Orzorga herself. The settlement is made up of camps, two Old Towers, and the inn called Orzorga's Kitchen. The settlement doesn't actually have a name in-game. Although the map marker for Morkuldin Forge points to here, the entrance can actually be found at the base of the cliffs below and can't easily be reached from here.